We strive to make healthy decisions fun and rewarding. That’s why we are excited to announce that we are now able to award points for heart rate. According to the American Heart Association, being aware of heart rate helps you stay accountable around your physical exercise. You shared heart rate activities before today through your Apple Health or Fitbit connected app(s). We are awarding you 200 bonus points for historically taking healthy actions, and will award you for all future heart rate activities. Going forward, you will receive 6 points/day for recording heart rate activities. We hope this update makes it easier to track your progress and reach your health goals. Thanks for choosing Pact – we hope it has helped you live a healthier lifestyle, and been that kick you need to get off the couch on rainy days. Sadly, after much discussion we have decided to shut Pact down. Here’s what happens next: The last pacts that users can participate in will end on July 9, 2017, and you will receive your final rewards on July 11, 2017. Once we reach July 11, 2017 we highly encourage you to request your rewards – you’ve earned them! If you are no longer actively participating in Pact, feel free to request rewards sooner, even if they’re under $10. Pact will keep responding to concerns you may have through at least August 20, 2017. Be aware that we may experience a higher than normal amount of inquiries (we’re not sure – we’ve never done this before), so we apologize in advance if we are slow in getting back to you. Although Pact will shut down on July 9, that doesn’t mean an end to healthy habits. For motivation like Pact, check out Beeminder, which is based on many of the same principles and has the same amount of time in the incentives space as Pact. Our Partners are all standup apps, and many have motivation features such as goals or training plans to get you going. Geoff and Yifan personally use Runkeeper to train and have found it a perfect complement to what Pact offered. SweatCoin is a step tracking app. You earn SweatCoins which can be used to redeem for fitness gear, electronics, or other cool rewards. The rewards change daily. 1000 steps equal 1 SweatCoin. They have a battery saver mode but it comes at the cost of not tracking as many steps. I don’t use battery saver mode because I have a portable backup battery I use if my iPhone battery gets too low. This app also has membership tiers. The more steps you have per day, the higher required membership to convert those steps to SweatCoins. Another fun thing through this app is In-Voting offers. Other users can post items they want to sell through the app. You can post your own items or services for others to purchase using SweatCoins. When you post an item or service, other users vote on including it in the Available Offers section of the app. Once it gets there, they can purchase it and you earn the SweatCoins! Available in the US, UK, and they are working on adding other countries. We pay you $10 for every 10,000 points you earn. Earn up to up to 80 points a day for the daily amount of tracked activity (biking, walking, running, swimming and other forms of exercise) you do. Earn up to 6 points per day for the social activities you do, like posting healthy activities on your favorite social media sites or logging your meals. Staying healthy is an ongoing process and we wanted Achievemint to reflect that. That’s why there’s no limit to the amount of rewards that you can earn. If you’ve been a member for a while, you might notice that you earn points more slowly. This allows us to let you earn unlimited rewards and stay motivated to keep doing healthy activities as part of your daily lifestyle. So, we think that’s a good thing. In addition, we’re adding new programs that offer extra opportunities for members to earn cash or rewards on top of your baseline Achievemint points. Stay tuned for more information about contributing to clinical studies through our new Achievemint Studies product! Points expire one year from the date they are earned. Once you reach 10,000 points, you’ll be eligible to redeem your reward. You can usually expect to get paid within 4 weeks, often sooner. Link certain fitness and social media apps, like Twitter, Facebook, MapMyFitness, Fitbit, etc. The program will track it and reward points from it. Click Here to Get Paid to Be Active! 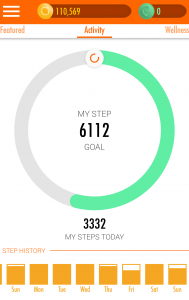 Carrot Wellness is an app that earns you points for steps you take. The steps are tracked with FitBit and Google Fit. Link your Fitbit device as it is a little more accurate in steps tracked. You can then exchange the points you earn for gift cards, entries into giveaways, and contests as well. You earn 1 point for every 1 step you take. Click Here to Start and get 1000 bonus points! You can also get local businesses to partner with the app and offer rewards to use at their locations and have Carrot send info to your employer to have them use Carrot as a way to incentivize employees to be more active ($250 bonus to you if they sign up)! WeFitter is an international app that rewards for fitness activities! Points can be earned through steps, biking, going to the gym, swimming, yoga, and other activities. These points can be used to get Runtastic Premium, discounts to some international stores, and gift cards. More rewards are added, so keep checking in to see what they have available. The app also has challenges you can join, whether with friends or other users to reach certain steps or activity levels to earn extra points. This is a fun way to see your activities help a group effort to reach goals you might not have been able to or motivated enough to do on your own. Sign Up Here to Get Rewarded for Being Active! And use code tlah6277661 for extra bonuses!